, a learned popish divine, but of great fickleness in his principles, was born in Worcestershire in 1500, and educated at Oxford. In 1527 he was admitted a probationary fellow of Mer ton-college, took the degree of M. A. in 1530, and was elected registrar of the university the year following. He afterwards became rector of Cuxham in Oxfordshire, principal of St. Alban’shail, divinity-reader of Magdalen-college, regius professor of divinity, and took his doctor’s degree in that faculty. | In 1537, he was made master of Wittington-college in London, of which he was deprived in the reign of Edward VI. In the first year of this reign, he recanted his opinions at St. Paul’s-cross, yet was obliged to resign his professorship at Oxford, in which he was succeeded by the celebrated reformer Peter Martyr, with whom he had afterwards a controversy. 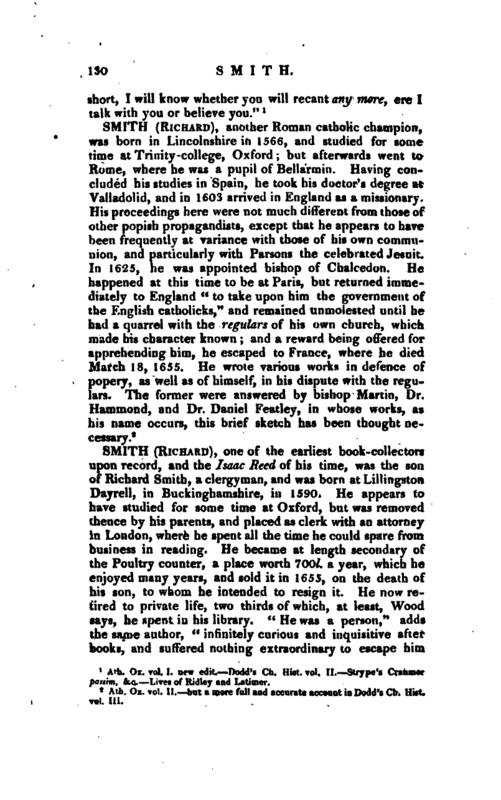 From Oxford he went first to St. Andrew’s in Scotland, and thenceto Paris, in 1550, and from Paris to Lovaine, where he was complimented with the professorship of theology. On the accession of queen Mary, he returned to England, was restored to his professorship, made canon of Christ-church, and chaplain to her majesty. 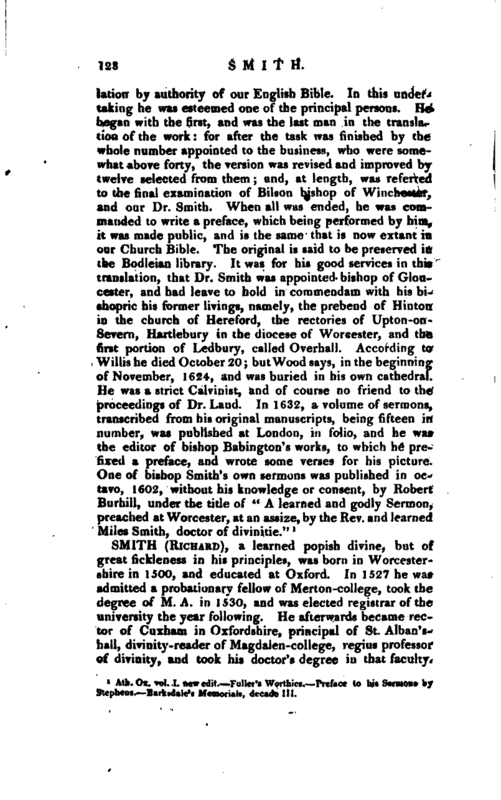 One of his principal appearances on record was at Oxford, where, when the bishops Ridley and Latimer were brought to the stake, he preached a sermon on the text, “If I give my body to be burnt, and have not charity, it profiteth me nothing.” This discourse, which lasted only about a quarter of an hour, was replete with invectives against the two martyrs, and gross assertions, which they offered to refute on the spot, but were not permitted. He was also one of the witnesses against archbishop Cranmer, who had done him many acts of friendship in the preceding reign. For this conduct he was deprived of all his preferments when queen Elizabeth came to the throne in 1559, and was committed to the custody of archbishop Parker, by whose persuasion he recanted part of what he had written in defence of the celibacy of the clergy. He then contrived to make his escape, and went to Doway in Flanders, where he obtained the deanery of St. Peter’s church, and a professorship. He died in 1563. 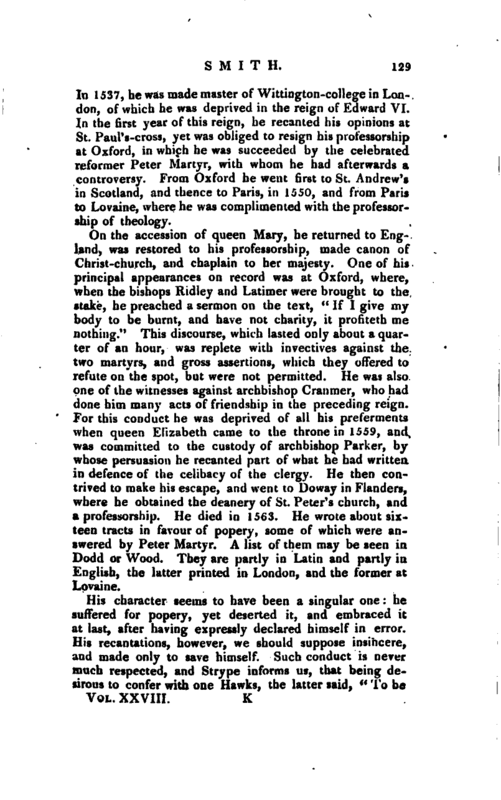 He wrote about sixteen tracts in favour of popery, some of which were answered by Peter Martyr. A list of them may be seen in Dodd or Wood. They are partly in Latin and partly in English, the latter printed in London, and the former at Lovaine. Ath. Ox. vol. I. new edit. Dodd’s Ch. Hist. vol. II. —Strype’s Cranmer passim. &c. Lives of Ridley and Latimer.